On our way home from Alberta last week, we spent a couple of days in Banff National Park. The mornings were cool and crisp, frost covered the rooftops and made us glad we'd thrown in our gloves. When the Canadian Pacific Railway was being built, this stopover was known as Siding 29. Three railway workers discovered mineral hot springs nearby and in 1885 about 10 square miles was set aside by the government of Canada as a reserve. The land reserve was soon increased and formed the first national park of Canada. I am so very glad that someone had the foresight to protect these lands. The beauty is astounding. People come from all over the world to see the Canadian Rocky Mountains and towns such as Banff, Jasper and Lake Louise. The railway magnate William Cornelius Van Horne envisioned a series of luxury hotels along the railway to entice visitors. One of these is the Banff Springs Hotel. Set in the shadow of Mount Rundle, at the meeting of the Spray and Bow Rivers, the hotel is enormous, yet dwarfed by its setting. We spent most of our time walking and hiking, in town and in the surrounding areas, around lakes, along streams, admiring the superlative beauty of God's creation. 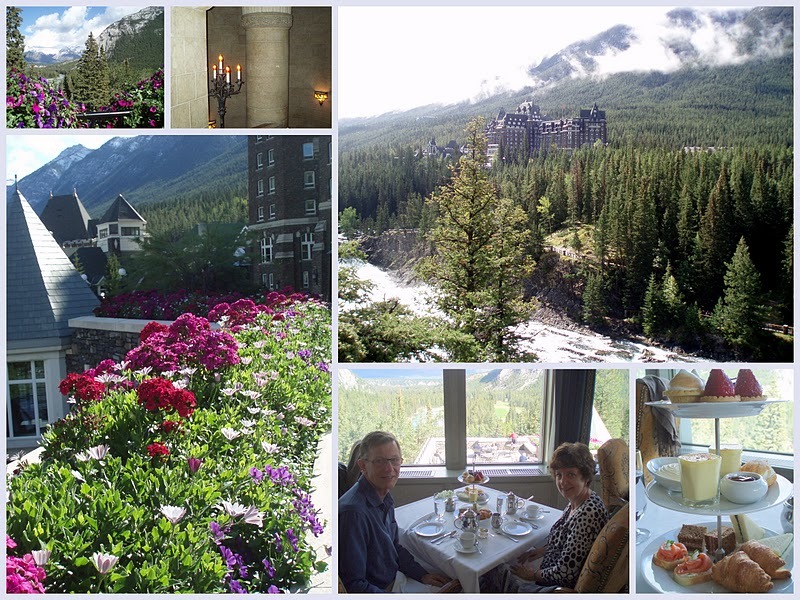 As a treat, we enjoyed afternoon tea in the Rundle Lodge of the Banff Springs Hotel. Our window table looked out onto truly magnificent scenery. Our waiter brought us the tea cart, from which we sniffed and chose our teas. I started with Vanilla Orchid Black tea - it was wonderful. I don't usually drink caffeine and after several cups I felt like I was vibrating, so I switched to peppermint. Accompanying the tea was a tiered server with dainty sandwiches (smoked salmon, watercress, egg salad and ham), fresh scones with Devonshire cream and strawberry jam, crème brulée, and a variety of sweets. We lingered long, soaking in the view, talking, and sipping, utterly relaxed. When we were first seated at our table, Tim looked around and said, "This must be a woman's thing to do." A few more men showed up later, accompanied by their wives or girlfriends. So I suggested that afternoon tea is something that men who love their wives are willing to do. And so, our holiday ended, we're home again. Tomorrow it's back to work for Tim and back to the books for me. But not for long! I'm linking to Mosaic Monday, hosted by Mary at the Little Red House. Every week bloggers link up with the most interesting and beautiful posts. Click on over, you just might like it. A truly beautiful part of the world. Is there a train from which you can experience some of this beauty? We have so many happy memories of trips through Banff, always with a stopover, even if only for a short time. I loved your comment about men and tea. The Great Dane will go to tea with me, quite happily, as long as there is lots to eat! Wow! A nice trip! Thanks for sharing! What a wonderful English High Tea to have in such a scenery! What a fabulous place! Stunning scenery. Sounds as if you had a great time and the tea eaten with that view must have been really amazing - so glad your husband was willing to do it with you! Guess the other menfolk were hard at work or they would have been there too! Devonshire cream eh? How is that possible or is it a type of cream available over there? The mountain and lake scenery is jus gorgeous. I would love to visit there someday. Your photos are beautiful. Thanks for sharing your lovely mosaics, have a great week! What spectacular views and from your description, it's relaxing too. Have a wonderful week. What a wonderful trip! The views are stunning. Beautiful shots. What a beautiful place! Looks like you had a marvelous time and tea, too! I would have been in heaven just staring at Mother Nature! Isn't Banff a beautful place!! Love your pics of afternoon tea and that Tim was a good sport!! The views are so pretty and I am glad that you had a great time sippin and relaxin! Enjoy your day. Stunning photographs of amazing scenery, they brought back marvellous memories of our RV trip through that area in the '90's. Love the discussion you & Tim had about teatime! What a beautiful place. Your mosiacs are wonderful. Love all of the pics. I love visiting Canada. Have not been here though. I will have to remember this. My hubby would have said the same thing. Nice though, that they are willing to do something like that for their wifes. Thanks for visiting me. Wow that place is awesome. Looks like I only see this in the movie. Love it! Ces paysages ont l'air à couper le souffle ! Et les photos de l'hôtel, miam, miam... j'ai surtout vu celles avec les gâteaux ! En tout cas ces paysages canadiens me font rêver de visiter ce pays. Wonderful Mosaic´s. Great work ! What a great place to spend time, and tea time is a great time for me. Beautiful mosaics of such a beautiful place.. Thanks for sharing your trip with us. What a beautiful view while enjoying your tea. Beautiful country. Oh Laurie, what a wnderful trip! I dream about visiting the Canadian Rockies one day by train, andvisiting all the towns you mentioned. Your photos were all magical! yes, I most certainly would be willing to spend time amid this beautiful scenery and if afternoon tea were thrown in, I'd force myself to partake of that too. Banff, a place I have longed to visit. Perhaps one day. It is truly beautiful and the water in Lake Louise is such an exquisite color. I am so glad that you are well loved and thereby enjoyed a delightful afternoon tea with your sweet husband. Oh my, look at the snow capped mountain! What a beautiful scene! The reflection of the clouds is so pretty! Thanks for stopping by the farmhouse for a visit and for the sweet comment! I always enjoy reading your posts! They are always filled with beautiful pictures and ooze with romance! You have a wonderful husband and are truly blessed! Thanks for sharing Banff with us! Canada is a very beautiful place. Maybe someday I will get to see part of its' beauty! 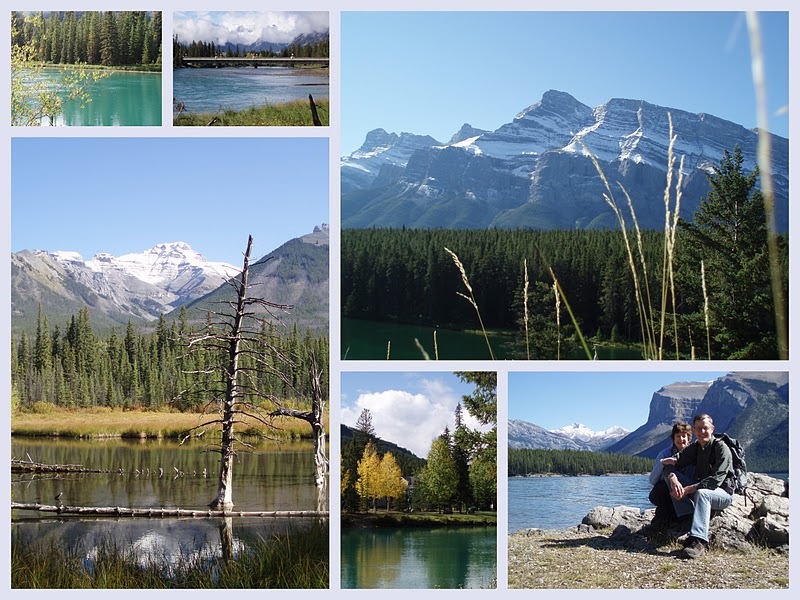 Thanks for sharing these lovely photos of Banff...it has been on my list of places I must visit for many years now...no luck so far but from your account it is still there "waiting" in all of its splendor. And as a mom with 2 far flung daughters...NYC and Paris...I know how you are feeling about Ashley...thank heavens for Skype, Gchat text messaging and all of the gadgets and technology that keeps us in close touch! When a person lives in Western Canada, Banff is always on the list of places we've visited. My fondest memories are of the camping trips when I was a child but all the other drives through such a unique place have been memorable as well. I am impressed that Tim came to tea with you! You will both be missing Owen and Ashley but perhaps soon you'll be planning a trip to visit them. I hope so! A beautiful spot, for sure. We have stopped by a few times on our way through...but never for days. I think we will make Banff our destination sometime soon. I'm smiling...that afternoon tea is something that men who love their wives are willing to do! Oh...and agreeing. Did he enjoy it? Absolutely DELIGHTFUL and looks like a real English tea.